SEOUL, March 15 (Yonhap) -- Before his nomination last summer for the U.S. 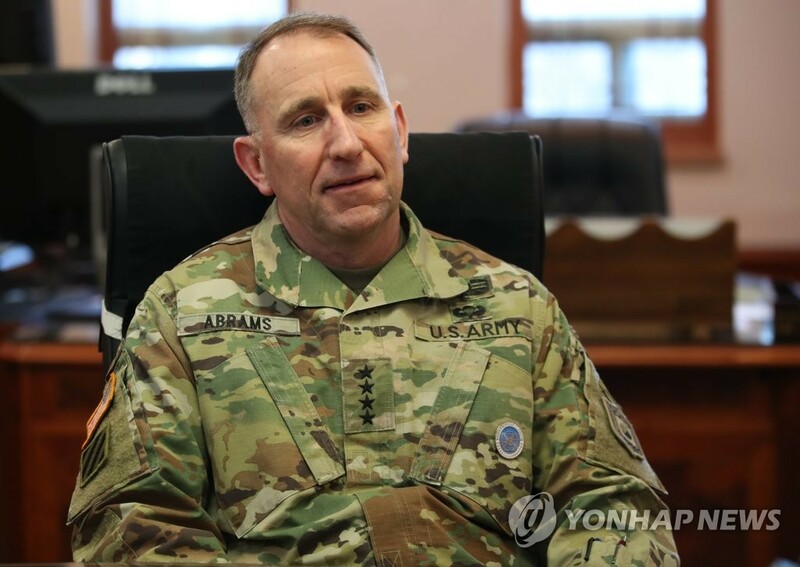 Forces Korea (USFK) chief post, Gen. Robert Abrams knew little about Korean food and culture despite his deep grasp of military operations for the divided peninsula. Four months into office, however, the seasoned commander has become a big fan of kimchi, a staple Korean side dish made of fermented cabbage, and of the Asian ally's culture that he has found "terrific and fascinating." "I love kimchi. So I've coined a new phrase, 'A day without Kimchi is like a day without sunshine.' 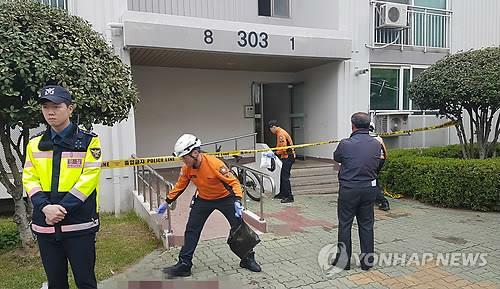 Seriously every day," he said during an exclusive interview with Yonhap News Agency at his office in Yongsan garrison in central Seoul this week. His swift adaptation to a new life here reflects his eagerness to fulfill a crucial part of his mission: building trust and developing camaraderie with locals to achieve the shared goal for lasting peace on the peninsula. Soon after taking the helm of the South Korea-U.S. Combined Forces Command (CFC), U.N. Command and USFK in November, Abrams put getting to know Koreans and their culture high on his acclimation agenda. Luckily enough, he has been surrounded by Korean colleagues like Seoul's Joint Chiefs of Staff Chairman (JCS) Gen. Park Han-ki and Deputy CFC Commander Kim Byung-joo, with whom he said he has been "linked shoulder to shoulder." "I have Deputy Commander Gen. Kim who is incredibly valuable," the commander said. "He is not only a deputy, but he has been taking me under his wing to school me on Korean culture and nuances of life in Korea. So it has been terrific." Though he had never been stationed in Korea before his USFK stint, the general was already well-versed in the operational environment here through more than a hundred Korea-based military exercises -- a reason why he was able to focus on learning about Korea in his first several months here. "My first 30 days ... it was non-stop getting to meet everybody, building relationships. 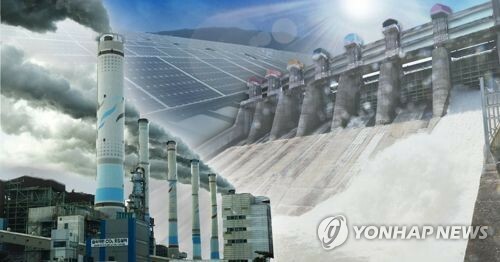 I had countless meetings with senior leaders from across the ROK government," he said. ROK stands for South Korea's official name, Republic of Korea. "I have been immersed in Korean culture, and it has been really terrific. You have a 5,000-year history. ... It has been fascinating," he added. 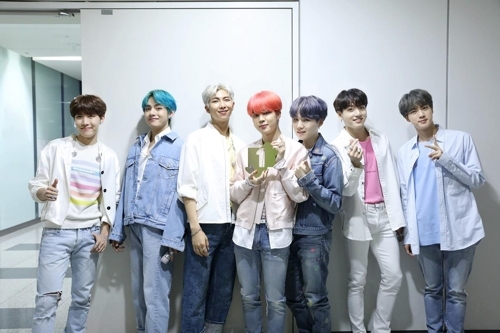 The commander even took a one-week leave of absence right after Christmas and traveled around Seoul and the surrounding areas with his son from the U.S.
"We've been all over the place. We've visited two or three ancient palaces and went to the (presidential) Blue House and Namsan Tower," he said. "I think I've been to every market in the greater Seoul metropolitan area. It has just been fantastic." Four months after his inauguration, he still vividly remembers the warm welcome he received during his change of command ceremony at Camp Humphreys, a sprawling U.S. base in Pyeongtaek, 70 kilometers south of Seoul. "I couldn't ask for a better welcome," he said. "It was very cold and raining. And I was pleasantly surprised by the very strong showing of all of the senior leaders, both civilian and military, from across the ROK population." 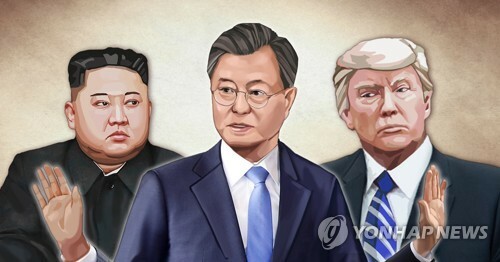 His tour of duty began at a crucial juncture for both Seoul and Washington, as the allies stepped up their diplomacy to denuclearize North Korea and establish a lasting peace regime on the peninsula. During the interview, the commander underscored his resolve to deepen the alliance, portraying it as "more than ironclad." "This is an alliance that was forged 69 years ago in the crucible of the land combat. It has been challenged over the years with many different factors, but the military alliance is rock-solid," Abrams said. "Korean people can sleep well at night knowing about the strength of the ROK-US alliance. The alliance is very strong. We have great relationships, and we have a ready force if ever called upon," he added. Abrams has an illustrious military family background. His father was Gen. Creighton W. Abrams Jr., a former Army chief of staff. Retired Gen. John N. Abrams, the former commander of Army Training and Doctrine Command, and retired Brig. Gen. Creighton W. Abrams Jr. are his brothers. He earned his commission from the U.S. Military Academy in 1982. He has commanded a series of key Army units in combat operations, including in Saudi Arabia, Kuwait, Iraq and Afghanistan. Before his USFK stint, he served as the chief of the U.S. Army Forces Command at Fort Bragg, North Carolina, from August 2015 until October last year. In the Army's largest organization, he led 229,000 active-duty soldiers.